Scholars at Risk will hold its second annual Student Advocacy Day at NYU DC on March 8, 2018. Students advocate for imprisoned scholars in D.C. at our inaugural Student Advocacy Day in 2017. 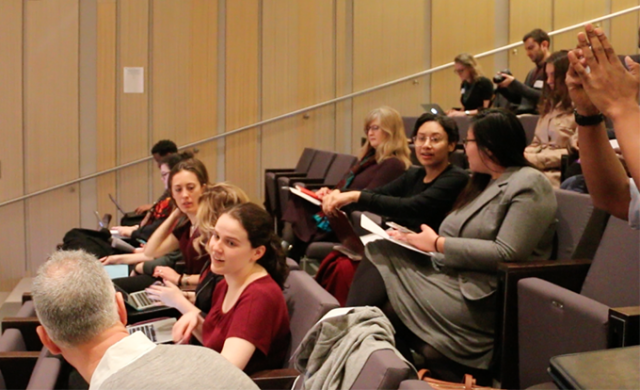 Student Advocacy Day convenes students and faculty participating in SAR’s Student Advocacy Seminars for an all-day workshop on advocacy and communications strategies to support scholars and students imprisoned around the world. Throughout the day, participants will have the opportunity to engage with staff from the US State Department, the Tom Lantos Human Rights Commission, and several NGOs focused on supporting prisoners of conscience. Students will then take to Capitol Hill the next day to meet with elected officials and discuss opportunities to advocate on behalf of their cases.